Simple slat steel flat benches featuring raised armrests—the perfect addition to any sidewalk, entryway or courtyard area. These commercial grade benches are constructed with high quality steel and welded together to withstand all the usage they will invite. 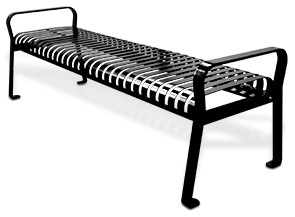 Engineered to wear well with continued seasonal exposure, these imported flat steel benches are finished in a seamless UV stabilized, corrosion resistant powder-coating. These 6' Commercial Steel Flat Benches are a great low maintenance seating addition for high volume outdoor locations. ►Need a Flat Park Bench Fast?